On trying to learn Chinese Cangjie input method for personal computers. I have not abandoned the project...I am still struggling with memorizing the secondary symbols. 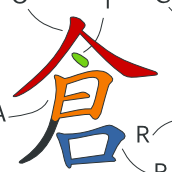 I have most of them down, but I struggle with the secondary symbols that fall under: 心，尸，and 山. Especially 心. I suppose this is because so many of them seem like a stretch (in my humble opinion). But mostly it is my own fault. I am terrible about remembering to do my Anki decks daily. Suppose part of that is because I hate flash cards to begin with. Seems like I can only remember on the weekends when my head doesn't get full with stuff from work. I found a really great app for a smartphone (iPhone and Android) for practicing Cangjie recognition and the keyboard. It is called 五色學倉頡 by Kotech (www.koketch.hk). It has a practice mode where you can pick three different levels: easy, intermediate, and difficult. It presents you with a Chinese character that is split into components by color. It also provides a Cangjie keyboard. The goal is to try to correctly input the character without mistakes. I much prefer this to reviewing my Anki deck. So I've set a goal to memorize those secondary symbols by the end of the month, or.....well, frankly I'll just keep going at it, I'm stubborn. But I want to try to reach this goal by the end of the month in all seriousness. Perhaps I'll try positive reinforcement--if I achieve the goal, maybe then I'll treat myself to a nice lunch? The past two weeks have been slow and steady with respect to my Cangjie progress. While it helps to work through practice exercises physically at the keyboard, I am finding that the best way to remember secondary symbols is to just use Anki and work through the memorization using a brute-force methodology. Interestingly, I find myself double-guessing sometimes, particularly with secondary signs that fall under 尸 or 心 primary symbol keys. When I look at the secondary symbol very carefully, and then look at the primary symbol, I eventually see the reason for its categorization. It is interesting how the brain can be drawn to certain areas first, and if one doesn't look carefully, one miss the fine details. I think in a couple more days I should be in good shape to move onto the third part of learning, which is learning how to decompose more complex characters into primary and second symbols. Perhaps this will be the hardest aspect, and I suspect it will require making lots of mistakes, checking the actual Cangjie code, and then doing it all over again. The first two steps have been finger "muscle" memory, but this third part is going to be more about training the eye. On a more positive note, I did get a character input into a dictionary tool without knowing the pronunciation the other day. It was a great feeling, and makes all of this work more worthwhile in my mind. I tried out the Cangjie input system that comes with MacOS El Capitan, which can be found under the Traditional Chinese language options. I was curious if it was possible to type in simplified characters using Cangjie on MacOS. As I wrote about in my first post, IBus in Linux only supports characters used in Hong Kong, and none of the Cangjie codes for simplified characters were working with IBus. I just wanted to report the good news that things work just fine in MacOS!! 車 can be input with the symbols 十田十 (jwj), and 车 can be input with 十手 (jq). Very cool! I should also mention that the MacOS has a nice system for figuring out the Cangjie symbols and pinyin for a given character. I have been away from the MacOS platform for about five years and just recently returned, and I don't recall this from previous versions of MacOS. 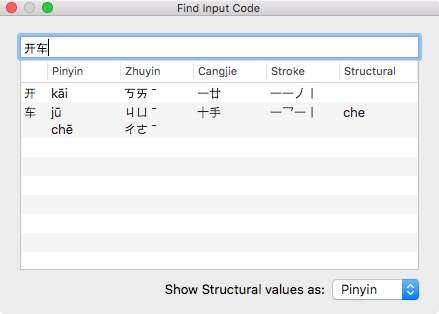 Using the "Find Input Code" option, in the IME pulldown menu, you simply paste the character(s) into the textfield, and it gives the pinyin with tone, zhuyin with tone, Cangjie code by symbol, and two other fields I am not familiar with (stroke and structural). For example, for 开车, see the attached image. Below are some examples of using Cangjie input with only the 24 primary / main symbols. Primary symbols are the symbols that are represented with a single key press. On a Cangjie keyboard, these would be the symbols you see etched on the keys along with the ASCII character. The first column is the target character, and the second column is the combination of primary symbols used to type the character (the actual key presses are listed in parenthesis). A character should be able to be input into a computer with Cangjie with no more than 5 key strokes. Some input codes are just one character (e.g. 金 is just 'c'), while most input codes are 3 to 4 key strokes. I am finding Cangjie is much like learning to touch type. You have to develop the muscle memory in your fingers and your mind to map the primary symbol to the proper key on the keyboard. As such, I created an Anki deck for the primary symbols and work through them both front side and back side. I also spend some time each day typing some characters so that I get the muscle memory in my fingers. The 80+ secondary symbols are required for more complicated characters, and then there are some core rules for determining which symbols are necessary to input a character. These rules have to be mastered because there are some characters that have 6 or even 7 symbols within the character, but only at most 5 are required to input the character. The secondary symbols closely resemble radicals from a dictionary, or even some of the symbols on the Wubi input method keyboard layout. There secondary symbol shapes in some way resemble the shape / form of the primary symbol. Tonight I am starting on the secondary symbols which will probably be time consuming and take a few weeks to really master. I found an interesting iPhone application (五色學倉頡) that allows you to practice Cangjie by showing a character with each primary/secondary symbol shown as a different color, and then you have to type on a keyboard the proper input code for the character. It is a great app to play around with when you have time to kill and nothing to do. If my Chinese reading were better I'm sure I could probably find other interesting apps for learning Cangjie. I decided to learn Cangjie Input Method recently. I often find myself in the situation where I need to look up the meaning and pronunciation of a Chinese word or character. But how can I type it into a dictionary using pinyin if I don't know the pronunciation? I usually find myself using a stylus on my tablet to draw the characters, or even using the mouse on a PC to draw the characters on screen. Worst case, I look up each character by selecting radicals. Having to draw or look-up the character slows me down so much when I'm really trying to focus on reading a passage, and I get less time to study and find I am spending a lot of time trying to input characters. When I lived in Japan I once witnessed a typist inputing characters into an old type-setting machine. The typist was reading hand-written manuscripts and converting these manuscripts to a digital format. The typist could input any character with only a few keystrokes, it was amazing. The typist was so proficient with this system that she found using a phonetic-style IME on Microsoft Windows to be very frustrating. She complained of having to type and then select a choice from a list, where as on the type-setting machine she could look at a character and quickly get it on screen. Also, if she didn't know a difficult character, she could still type it without having to know the pronunciation for inputting the character. Of course she had to learn this typing system and I am sure that it took time to master. Is it worth it to learn a non-phonetic based input system? Perhaps. I learned to touch-type when I was 15 and it changed my life. It took time and work, but it has paid off in many ways and was well worth the time investment. Perhaps Cangjie may offer a similar experience? Before committing to Cangjie, I looked into other systems, such as Wubi, but it appears that Wubi is only for simplified character sets (as I understand it). As primarily a student of Traditional characters, I wanted to learn a system that could do Traditional characters at a minimum. I also thought about a hand-writing based input system, which would be good for remembering how to write by hand, but I still think a keyboard is more practical. The first week was good overall. There were some surprises to begin with. I'm working mostly from a Linux laptop with the Ibus input system. Unfortunately, the Cangjie plug-in for Ibus only supports characters used in Hong Kong, and as such it is not possible to input any simplified characters. Other Cangjie implementations allow this from what I have read, such as Twinbridge (which doesn't even appear to be in active development and is Windows only). I'll have to try out Cangjie on Mac OS X next to see how that goes. While this is not a show stopper for me, it is a bit inconvenient. I'll still have to use pinyin for when I need to type a Simplified character. Learning Cangjie will clearly take time though. I memorized the 24 primary/main signs and practised typing some characters and words that can be input with a single or combination of the primary/main signs. Note: signs are like radicals...but not the same thing. Signs are character components that make up a complete character. From this point forward it is going to get hard though. The next step is to learn the secondary signs (80+), and then learn the rules for identifying the proper order and identification of the signs. I hope to have more progress to report next week.